Ms. Carmina Carter had her first child when she was still reaching adulthood herself at the age of 15. She had her second only a few years later, and with little support from family, Carmina’s ability to graduate high school at that time became more difficult and raising her kids became her first priority. 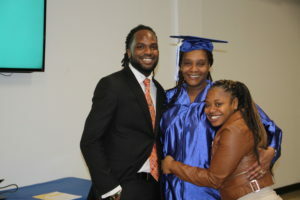 But it was seeing her first-born son graduate that inspired her to achieve her high school diploma as well, at the age of 40, with three kids, while her 16 year old daughter was in 10th grade at Martin Luther King High School. “I love Matrix, I thank Matrix for opening the doors for me to make it where I’m at today”.